When using online ads to get an idea of what a particular model costs - be careful. The cost of the same model trailer can vary considerably depending on where it is and how much demand there is for that model. A trailer that is $15,000 in Michigan might be $18,500 (or more) in Maine. It's not that the Maine dealer is a scoundrel, it justs costs much more to get the trailer to Maine. Lower volume dealers may need higher mark-ups just to stay in business. If there is local demand, dealers will discount less. If the dealer thinks they will have no problem selling the unit, the price they'll want for it is going to be higher than other less salable units. 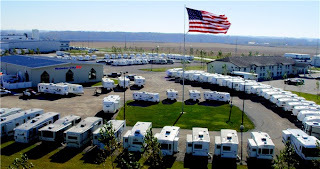 Also realize that in the rv industry two people buying the same kind of rv on the same day from the same dealer, will almost certainly pay different prices. You could bet he second buyer will pay more. The price you find on the internet is not the price you'll pay at a different dealer (and likely not even the price you'd pay at the dealer who posted the price as prices are typically negotiated). Internet pricing can be very inaccurate compared to what you may actually pay. You may pay a lot more - or less - depending on the circumstances. Due to the impact of transportation costs, the price you'll pay in, say Alberta, will never be anywhere near as low as you'll find online from dealers near Indiana where hundreds of rv brands are manufactured. When I was in Indiana to pick up my Camplite trailer at the Livin' Lite factory I stayed at the Holiday Inn in nearby Elkhart. Across the street from the hotel was a fenced parking lot packed with beautiful new rv's. In one corner were several Livin' Lite products. At the factory I asked about it and Don explained that it was a rv transport company and all the rv's were locally manufactured units being delivered to dealers. Apparently shipping an rv can cost as much as $2.50 to $3 a mile! Don explained that the cost can vary depending on the order. If a dealer's order is for multiple units, and they can be shipped together on a flatbed, then the cost per mile will be less than shipping a single unit. This favors higher volume dealers who can get the benefit of lower transportation costs. Given the significant cost of transporting rv's to the dealers it should be understandable that there will be higher prices the farther the dealer is from where the rv is manufactured. It also highlights that if you ask a dealer for a quote, what transportation costs they carry likely reflect the higher cost of getting your single rv to the dealer. The transport costs could well be higher than it was for the bunch of units on their lot that they bought in one order. It can also explain why many dealers carry a brand for which their pricing seems better than the other brands they sell. It could be the costs are lower because the dealer is closer to that particular manufacturer. 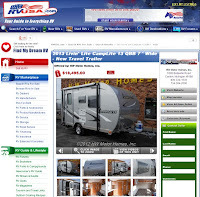 Use the internet searches at sites like rvt.com, rvusa.com, or rvtrader.com to get a rough idea of what a trailer might cost. It won't be accurate but hopefully it will help you plan a preliminary budget. If you are serious, contact a dealer and have them work you up a quote. That will be a lot closer to what you'll have to pay but expect that a negotiation will likely lower that quote. If the quote is much more expensive than equivalents seen in your internet searches, keep a cool head! Rather than get angry try to look at it objectively. What impact does transport costs have on the total quoted price? Look on the internet to see the particular dealer's own ads. Even for brands other than you are interested in. You might be able to get a better sense of what kind of discount the dealer might accept in a negotiation. If you are interested in a aluminum trailer like I bought, note that on the Livin' Lite website you can search for your closest dealers. For most it is unlikely you'll find a dealer just down the road from where you live. If you're lucky the closest dealer may have some units you can look at. Call ahead to ask what inventory they have. It is very unlikely they'll have the exact model you want so don't expect that. As most models of Camplites & Quicksilvers are similarly constructed just seeing any model can give you a good review of Livin' Lite's quality etc. I bought my own Camplite without ever having seen another Camplite in person. I had done lots of research and was confident that the quality would be great - and I was not disappointed. In conclusion I hope this posting helps someone. In an ideal world you'd be able to get accurate pricing info easily. When buying a trailer it isn't that easy. I just got a very nice email from you about my first blog (regarding PEI) and wanted to say Hi and thanks so much for your kind comments. It's always nice to get positive feedback on blogs, esp. ones that take so much time (the photo processing...and that's the #1 reason I'm always so behind on all my travel blogs!). We loved PEI! We loved that it was so idyllic and yet so functional at the same time. Just people living their lives without all the hub-bub. Guess they go elsewhere for that if they want it. Works for us! That's kind of what we do. We live out in the boonies in San Diego (believe it or not, there is such a place in SD!). It's a 25-90 minute drive to any shopping or visiting. But our spot (that we live in part of the year - the rest of the time, of course, we're on the road - in one of those gigantic motorhomes you mention :) is so pretty, peaceful, and private. So, from looking at your blog, I guess I need to welcome you into the RVing and blogging worlds! Congratulations on your new purchase! I hope you and your wife have many rewarding adventures! Speaking of "small," lightweight trailers, we saw one on our travels that was super cute! I guess it's also super expensive... But if you go this entry, you'll see a picture and find a link to their website, just for fun: http://carriebartonphotos.blogspot.com/2011/03/around-our-house.html The company is Canadian - Safari Condo, and the model is the Alto. Hi Carrie - Thanks for stopping by & commenting. PEI is very much as you describe it. It really is a great place to live and raise a family. With our largest cities being just towns we really avoid the hustle & bustle of more urban places. I sometimes describe PEI as being about one-quarter the size of New Jersey but while they have over nine million people we have just 140,000! The funny thing is Prince Edward Island is the most densely populated province in Canada (a fact which most Canadians don't know). Our population here is spread out and you can never be too far away from a farm house etc. In the other Canadian Provinces there are vast areas of uninhabited wilderness that lowers their average population densities. You are right that the Alto by Safari Condo is very cute. I've seen a couple on the highway. All their products have a very European feel about them although, as you note, they are made in Quebec. For whatever reason I think they are only allowed to sell them in Canada. The company also makes very appealing van conversions -- sort of like VW Westphalia camper vans but on steroids. If you are ever back this way we have room in our driveway for both our little trailer and your "gigantic" motorhome. If you can stand the mosquitoes, our peaceful driveway has a water-view and consistently great sunrises & sunsets.